If there's one thing I'm really, really good at, it's worrying. I specialize in worrying about things that I have very little to no control over, and if I'm not careful, I can bring myself to tears thinking about something that has not yet happened or is not even likely to happen. One time my husband found me crying, and let me tell you, he was very puzzled when he found out that I was crying over his untimely death. So, thank god for knitting! It has been a lifesaver for me – I can usually put a stop to my obsessive worrying by working a few rows. The last few weeks have given me the opportunity to research knitting's stress-relieving qualities in full measure, and the results are interesting, to me at least. It appeared that different kind of worries were eased with different types of projects. You don't necessarily need heavy garter stitch therapy to make you forget the six extra pounds on your waist. Minor worries (like those six extra pounds) can be easily forgotten with a good Nancy Bush pattern. This one was perfect – the need for slight modifications kept me glued to the sofa, which also made me happily forget the fact that I could have been exercising instead of knitting. Medium worries (like work related issues that have made me grind my teeth in the bus all the way home) are best fought with the combination of a simple project and luxurious yarn. 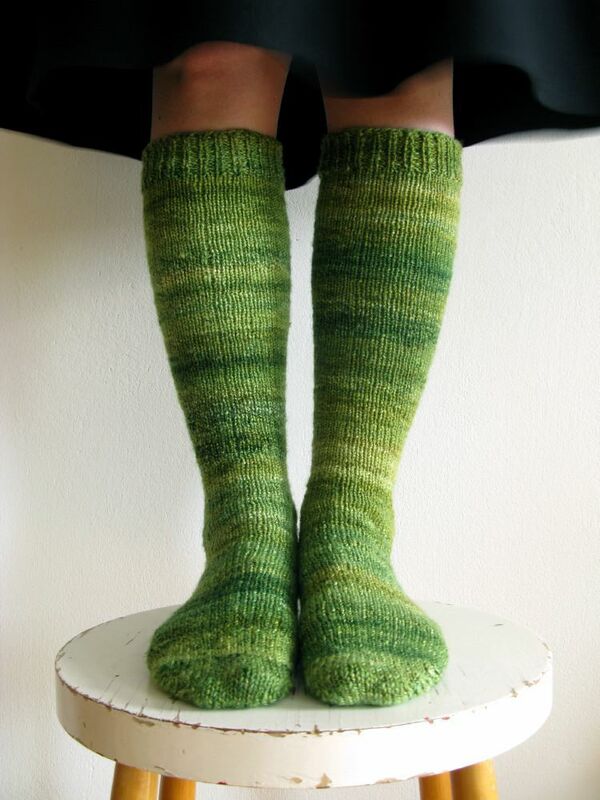 For some reason I had been saving Krista's beautiful handspun instead of knitting with it – stupid really, because knitting these socks on my commutes made me come home much calmer and happier. My husband and son thank you too, Krista! For major worries (like anything that has to do with my son. If I'm worrying about him, it's always major. Even if it's actually something not that serious. I blame that love thing.) there's really only one thing that works: garter stitch. The ultimate garter stitch therepy: knitting small squares with brightly coloured leftover yarns, so you can feel thrifty too. The sad thing is that I've now used almost all of my sock yarn leftovers, so I better not encounter anything major before I have knit more socks. 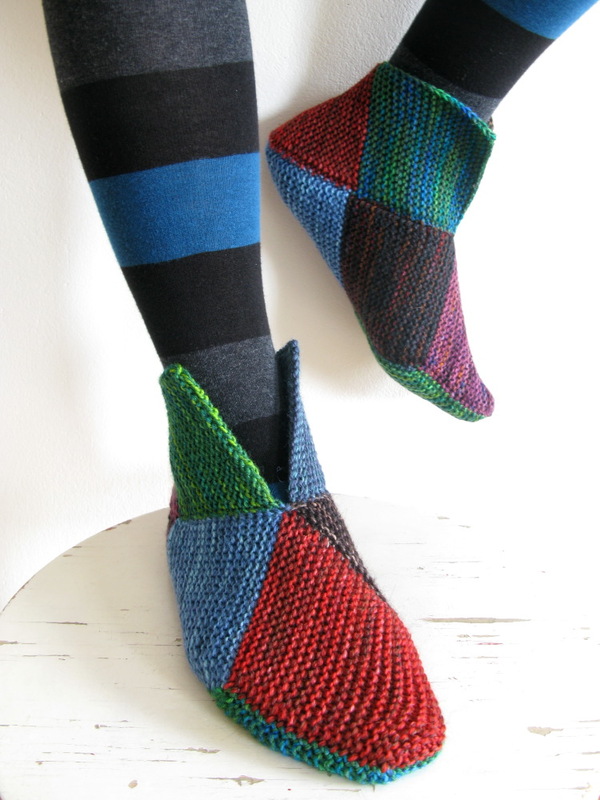 Right now, I'm back to knitting some Nancy Bush socks, so all's well. Worrying is such a waste of time, and I'm actually really trying to learn not to let it ruin my life. Trying to think positive and enjoy my life. And knit a little too. posted by Terhi @ 7:19 ip.